Oh, the tub. It’s arguably the best part of any bathroom, so why are we always content to store it away in the corner like it’s the opening act, not the main event? These bathtubs, far from ordinary ceramic hidden by a plastic curtain, are so fantastic they deserve to be on display. 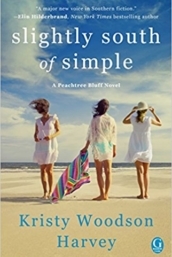 This one is like canoeing in the fall air without ever even leaving the porch! And bathing with a view? Yes, please. We bet that copper holds heat like crazy, even on a chilly morning. Speaking of copper, it seems to work pretty well in a more traditional bathing space as well. Perhaps it’s a side-effect of the up-all-night-with-baby delirium, but we can’t think of anything more divine than diving into this beauty and soaking up the view. Plus, it goes without saying that we are huge fans of a chandelier in the bathroom. So old-fashioned and so fabulous. There is nothing like rustic charm. 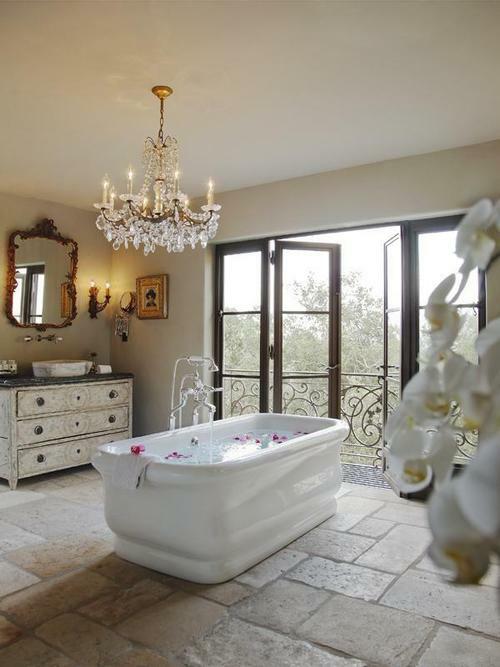 With a view like this, why wouldn’t you situate the tub to accommodate it? We love this combination of chrome and mirrors. It’s so sleek. This is perhaps our favorite of the bunch. Gold, a claw foot that really makes a statement and that ceiling… Who wouldn’t want to bathe in her own personal Sistine Chapel? We’d like to be watching The Today Show in this tub this morning! We hope you all have a fantastic, relaxing Tuesday. Thanks for stopping by! Love seeing the tub take center stage! The copper ones are just gorgeous! 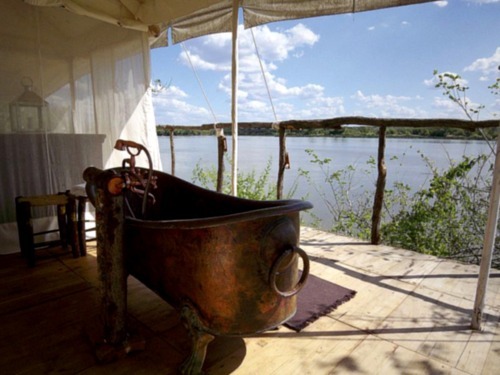 My favorite tub of all time was the big copper clawfoot in our tent when we were on safari in Botswana for our honeymoon. “Camping” at it’s most glamorous! 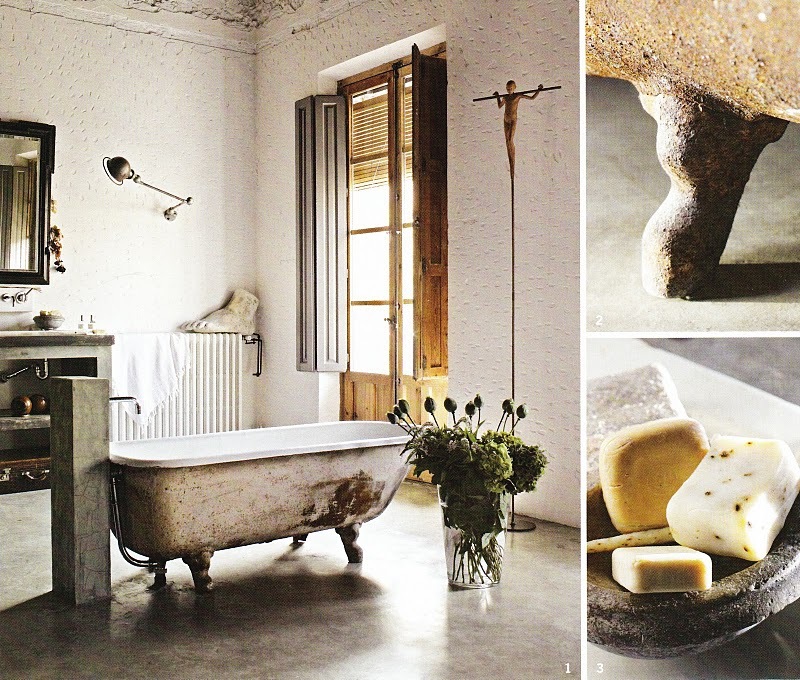 Beautiful baths, seeing these photos considering getting a bath tonight, including hair mask! Bathing with a view? Yes, please! So often ceilings are ignored in design–but that photo of the purple bath with the gold tub really shows how a ceiling can truly become a “5th wall.” Oh the daydreams I’d have in there …! 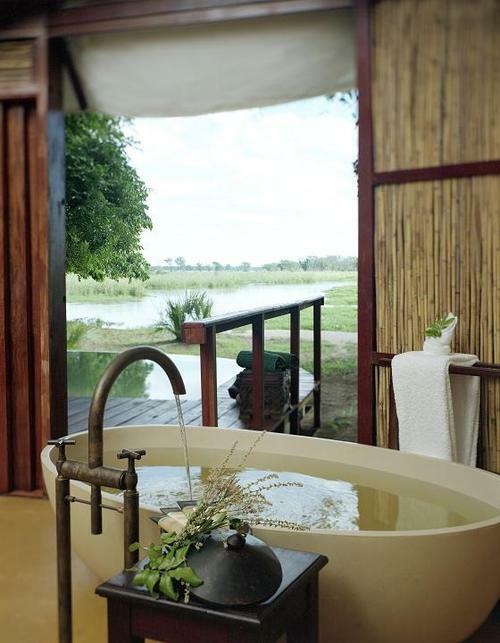 Soaking in a tub with a view….yes please! We have an antique claw foot tub that sits right beside a huge window looking out on our side field and the veiw is stunning. Add in a summer breeze and fluttering summer drapes and it’s heaven! These are all great tubs and bathrooms! Now this would be a fabulous way to either start or finish the day! BEAUTIFUL! I think the copper tubs are my favorite! I told my husband just a few days ago how I dislike most bathtubs that are tucked away in the corner (like the one in my bathroom). Btw, not complaining; I’m not complaining, just stating facts. 😉 And speaking of facts: you have delivered yet another beautiful post! All beautiful!! But I do also love the feeling of being enveloped by the walls around an enclosure – but having a view while soaking is the ultimate treat!! I do love a soak with nice bath products. All your pictures are beautiful! I had the best bath experience this past weekend while I was visiting the Park Hyatt in Chicago. They had cool crystal votives and wonderful bath salts. The bathroom had soji-like doors that opened into the bedroom. The design was amazing. 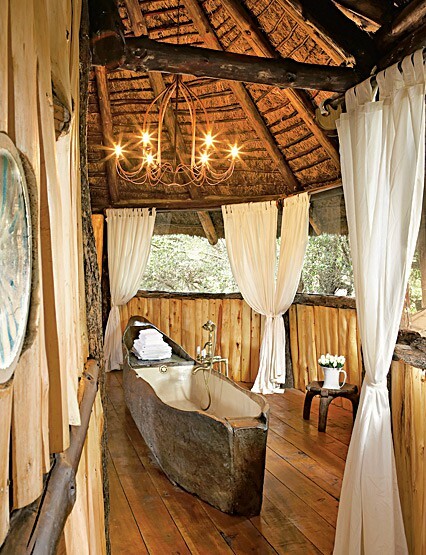 these are the most amazing bathrooms!! And those bathrooms look so divine. Any of those would be a perfect place to bath and relax. oh Dreamy! I love stand alone tubs! Great post as usual! Hope all is well with the new bebe! Couldn’t agree with you more! Why not make a tub center stage!! These pictures underscore that to perfection…so many beauties! Almost three years after the death of my son, Luke Borusiewicz, who died at the age of two years old in foster care (the average age of children who die in foster care is four and under), the inquest into his death has still not begun. A pre-inquest conference was held last week where I attended by phone, but hung up minutes into the conference after hearing blatant and misleading lies from the Queensland Department of Community Services representative. It disgusts me that anyone can tell lies about a deceased baby, but a senior representative of an agency existing in the interests of protecting children, telling lies to protect its own evil interests is incorrigible. The judge at the conference has ruled that Luke’s death has still not been investigated properly, another abomination. I promised Luke the last time I looked at him laying there in his coffin I would do something about what the department of community services had done to him, and that I would do something to fix the child protection and foster care system, which had mistreated him from the time they had come into our lives. People need to realize, this is not a one off case. Atrocities like this are a daily occurrence in the department of community services, world wide. These child protection officers are answerable to no one, they are unaccountable for their actions and operate behind a media ban which helps to conceal their mistakes and malpractice. The department of community services complaints hotline is a smoke screen for the department, acting as an early warning system alerting the department when their dishonest and unethical behavior has been discovered, allowing time for false statements to be concocted, evidence to be destroyed, and threats against distraught parents to be made. Whilst the media are gagged when it comes to exposing the corruption rife within the department of community services, and politicians turn their back on the problems, I have devoted my life to this issue. Parental rights are a thing of the past once a child protection worker enters a family home. The onus is on discrediting a parent, no matter how much love the child and parents have for each other. Luke was everything I ever lived for, still is and always will be. I am quite prepared to go to jail for speaking out about the abuse of power and families by the department of community services staff, especially management, which is where the root of this child stealing machine is routed. This last month, first time visitors to the site have increased by 650%. The website Crimes Against Fathers (http://www.crimesagainstfathers.com) has contributed toward a facelift and maintenance for the site. I am in the process of picking myself up, and dusting myself off. I still can’t talk about what was done to Luke, I wake up screaming and crying from nightmares, but my faith in God, and my solicitor, eases my anguish. The next step for me is to establish a commercial vegetable growing enterprise entitled “Luke’s Army Vegetables”, which will be sold with labels containing links to the website, and the desperate pleas of parents who have been mistreated by the department of community services, their children wrongly removed. This plan is already underway. 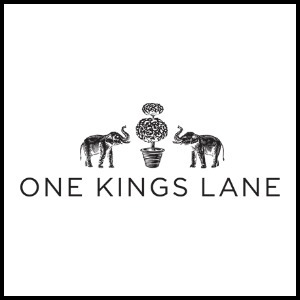 Through this venture I intend to fund legal support for parents who have no hope in this corrupt and cruel system of gaining true legal support. I would like to sincerely thank the many people who have given their support and encouragement through this sad time in my life. Thankyou so much for those who post on the site, and all who have joined Luke’s Army, which is now reaching 5000 members strong. Most of all I would like to thank my Lukey Pookey, who showed me what love is, and has given me everything I have in my life, I owe you my life Luke, I love you more than anything in the world son, for ever and ever, RIP. Love the tub! These images are beautiful. Girlfriend! You did a days work in finding these fabulous images. I am obsessed with the canoe tub. Just when I thought I was over “the bathroom” I find myself designing a new house in my head just to get a tub with a view. All spectacular, but the canoe one is absolutely my favorite. I’d never get out of it….! I also love that rusty old clawfoot tub. Stumbled upon your blog looking for fall inspiration….! I think tubs should be the focal point of the bathroom. It sets the tone for a spa-like experience. My fave is the Waterworks tub, but all of these above will do. Gorgeous examples! 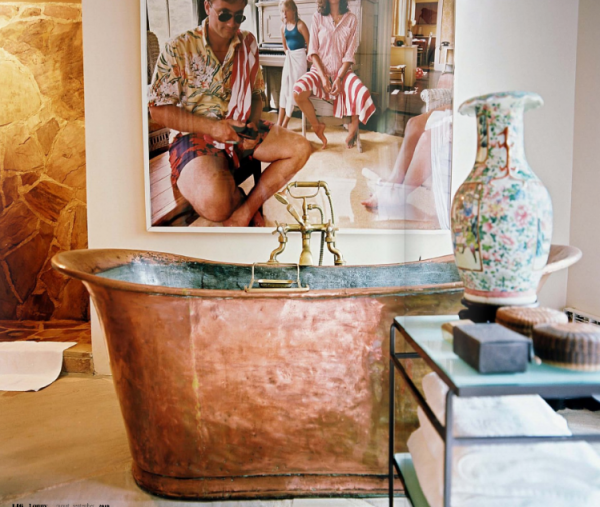 I love every single one of these copper tubs – but I wonder if they all need polishing. This is what every woman needs – love a tub serving as the main event!! I so agree with you on the placement of a bath tub. I really don’t feel comfortable in ‘corner baths’. Freestanding, airy and if possible, a little raised is my preference. Not only are they centre stage, they have amazing views! love! the last picture is my favorite, the oval shape of the bathroom, the tub but my favorite item of them all the stunning mosaic floor design…! I actually looked over everything twice, so as not to miss a single thing… I would love a grand bathroom with a central bath one day. My current bathroom is quite quaint, though lovely, and I crave wide, open space and more luxury… incredible! All so beautiful, but the last one is my favorite!